Sailboat Cruising, I’ve got to keep learning! Since me and my family live three hours from the ocean, I’m obviously not on my boat as often as I want to be, but I want to keep learning as much as possible on technical sailboat cruising subjects. These are often the ones that involve expensive specialty experts; who are more than happy to come to your boat and do whatever needs to be done, for a price per hour. I know,,,,I’ve hired the best of them,,,,from surveyer, rig inspector, diesel mechanic, electrician, gelcoat repairman, polisher, bottom cleaner and the list goes on. These would have been very expensive ventures if I simply sat back with a Corona and let them work while I relaxed in the hammock. Since I don’t do this and follow thier every move to learn as much as I can, I chalk each of these bills up to training AND repair cost on my boat. Thus, if you figure out how much that electrical training and work would have cost if done separately and amertize those two costs together, it’s really quite affordable? Right,,,,see my logic? This the point in the blog where people with true mechanical skills roll thier eyes in disgust! Yes, Yes, I could have spent countless hours trying to figure it all out for free and read the manuals, but I just don’t always have time,,,,but I’m learning quick. To keep learning while away from the boat, I’ve found that the various cruising and sailboating publications I buy often have articles with vast amounts of good, solid technical advice, so I started saving them for future reading. Today was cleanup sunday,,,and when I looked under the bed and realized I had more than 100 sailing magazines under there, I knew it was time to start actually looking for the articles I wanted to keep. Much like Captain Couch’s “The Checklist” I’m keeping articles that have specific training and learning points I need or interest me. So, I simply ripped them out and put them in a folder for a time I want to reference back to them. I’ve got stacks of articles that cover: boat buying, places to visit, natural energy (electrical), kids on sailboats and plumbing. This doesn’t mean I don’t have personal experience with all these things, it just means I want to hear what others say about them and probably find expert knowledge and great ideas from others. Since I can’t get to my boat all the time, I’m going to keep collecting articles till I’m comfortable with the subjects,,,,but I’m no mechanical or electrical genius, so I’ll keep reading. Houseboat or something larger- Do it while you can! Freshwater houseboat or something larger- Jessica made a comment on the blog about owning a fishing skiff for freshwater, but her husband always wanting “a houseboat or something larger”. Hope you don’t mind, Jessica, but your comment motivated me to re-read a few buy the right boat articles I have here at the house, and I wanted to take few minutes to throw my thoughts into a readable post. While I have some really, really smart experts who follow this blog and even may read it from time to time, I’m NOT a boating expert by any means, thus I read a lot to see if my thoughts match what experts say. First,,,,I have no idea how old you guys are or if you have kids, aging relatives or a ton of responsibilities that preclude a purchase; but my advice would be to seriously think through a lease or purchase of the houseboat or something larger,,,,while you can. I’m motivated in this thought by my own experiences and other’s heath scares that precluded them from doing what they always wanted to do, simply because they waited too long. I hear a lot of folks who say they always wanted to get a houseboat, sailboat or fishing boat to spend vacation or weekends on, but wait too long. They get older, they can’t afford it or a major health issue comes along and those people fall into the “wish I would have done it while I could category”. Second,,,,for a larger purchase you can of course buy new or used; but I recommend you follow the same process as buying a sailboat or powerboat. If the boat is large enough to live on (kitchen, bathroom) then it could be used as a tax write-off in the second home category. Thus, I would recommend you get a surveyor who specializes in that type of vessel to look it over, take a test drive in it and get it out of the water to look over the bottom. I’m no expert in fresh water boats, but these steps just seem logical to me. 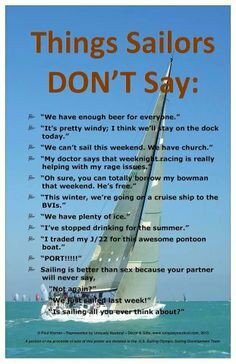 Most larger boats have some form of bilge and engine, make sure you and your husband get a good look inside,,,clean bilge =’s happy wife as there will be less smells! Been awhile since I’ve been on here, but for good reason, I’ve been working on the boat. The challenges I’m having with the boat are NOT mutually exclusive to a Hunter, but they do seem to be coming on fairly quickly. I can’t blame the surveyor, I won’t blame the surveyor, but I’m a bit bummed because some of the challenges should have been found early, and may have prevented us from buying this particular boat. 2. The boat has a dripless shaft seal,,,but the surveyor may have missed an important point during the inspection, which is that there’s a piece of it that’s supposed to be aircraft grade materials, but appears to be deteriorating,,,,supposed to have a nice smooth shiny surface but instead appears rough, rusty and cracked, like something’s been hitting it. No pun intended, but the rub of all this is that the only way to fix a dripless shaft seal if to haul the boat out of the water and have the prop moved,,,,which of course I have to pay for fully,,,,instead of finding it during survey and having the previous owner or the other broker fix it before final paperwork was signed. I am NOT bitter at the surveyor, but I wish I had known about this beforehand. But, the good things are that the boat is easy to sail, appears to have a decent engine (Yanmar), and now has 300 feet of new chain and a new anchor. I had to go with an anchor the reviews all say is decent and uses new technology to surpass some others (a Rocna- 55 pds), I feel pretty good about this choice. I’ve also gotten rid of the 740 feet of chain the boat had, replaced with 300 in front and 40 in back plus rope rode. I’ve cleaned out the back locker which had a large amount of stuff that I don’t think we needed and I’ve had to get ride of other stuff the boat just couldn’t use. I’m bummed we have to eventually get a new radar and chart plotter, but that’s part of the game I guess. So,,,in mid January we closed on a 2000 Hunter 460, AWB (another white boat) but ours! After all the years of looking and dreaming about buying a boat, it was almost anti-climatic since it was so hectic getting things together to close, re-name and move the boat to the new slip that I was overwhelmed and probably didn’t enjoy the experience like I should have. We re-named the boat properly, denaming it and re-naming it and then pulling off the paper to show the name, properly envoking Posidion and the other Gods and getting all the permissions. On top of getting all this together, the surveyer had mentioned one small repair that was needed, but when he puts the word bulkhead in the survey, the insurance folks read a bit closer. So, because of that, I had to have a whole new bulkhead rebuilt forward of the V-Berth and behind the chain locker and the whole rear portion of the chain locker,,,,with extra fiberglass for reinforcement, which makes me feel better. This wasn’t cheap, but made me feel better like I said. In the course of all this, I was also informed by the fiberglass guy and my broker that the boat had over 600 feet of chain (some of it rotten) just in the forward bow chain locker,,,which they had dumped overboard so he could work on the bulkhead. I was forced to bring it all up, 300 feet by hand. The chain is rotten and rotting together because it was left in the locker wet, now waiting for me to sort it out. No worries, I wanted better chain anyways. I am thrilled to have a new (used) boat, which will be a highlight of my life and I will use the next three years to turn it into a cruising sailboat safe enough for my family to Bluewater Cruise on, leaving the US in approx 2.5 years for adventures afar.